Although traditional jewellery was worn throughout Sweden, and has a distinct Swedish character, there are marked differences between the different provinces. Skåne province, in the extreme south of Sweden, has the richest tradition, and more jewellery was worn there than in any other district. Almost all the Swedish traditional jewellery at the V&A comes from Skåne. A well-dressed woman from Skåne wore multiple pairs of silver clasps along the front edges of her outer clothes. Some of these were functional, and hooked into each other. Others were purely ornamental. Heart-shaped clasps like these were originally worn as cloak clasps, but by the 19th century they had moved to the outer jacket, and were often purely decorative. Clasps decorated with filigree were a speciality of the silversmiths in Lund and Ystad. This pair is marked with the griffin mark of Ystad, the date mark A5, for 1855, and the maker's mark JW. Jonas Wahlberg was a prolific maker of traditional jewellery, who worked in Ystad from 1834 to 1859. 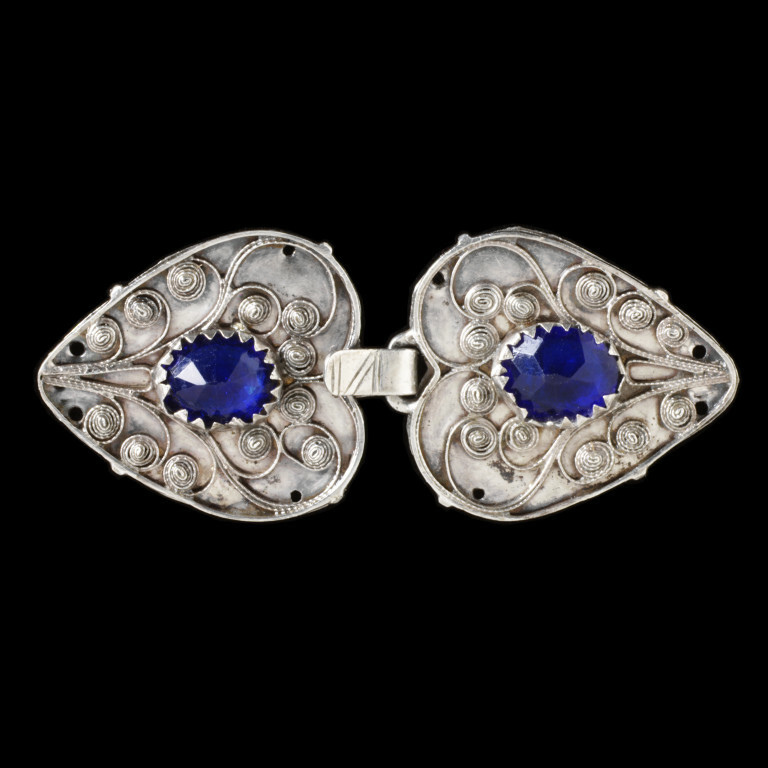 Jacket clasp consisting of 2 heart-shaped parts of open filigree attached to a sheet metal back plate, each set in the centre with a large oval faceted blue paste. Mark of Jonas Wahlberg of Ystad. On the back of each part. 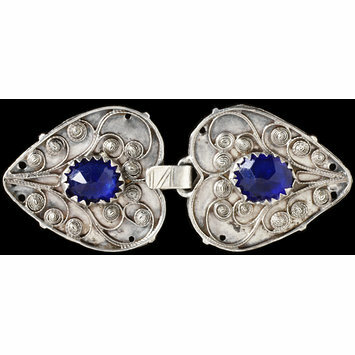 Heart-shaped silver filigree jacket clasp set with blue pastes, Skåne (Sweden), 1855.